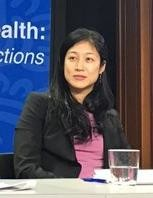 Grace Chan is an Assistant Professor of Pediatrics and Epidemiology at Harvard Medical School and the Harvard T.H. Chan School of Public Health. Her work focuses on improving maternal and child health in under-served populations by using epidemiologic methods to discover and deliver evidence-based interventions. In partnership with the Ethiopian Public Health Institute, she leads HaSET (“happiness” in Amharic) a program for maternal and child health research in Ethiopia. With colleagues at St. Paul’s Hospital Millennium Medical College, her team established a health and demographic surveillance system in rural Ethiopia to better understand the causes of maternal and child morbidity and mortality. Research projects focus on understanding the etiologies and causes of neonatal sepsis, antimicrobial resistance patterns among pregnant women and their newborns, and the mechanisms for adverse birth outcomes. Collaborating with the World Health Organization, she is developing strategies to accelerate effective implementation of Kangaroo Mother Care for preterm newborns and designing studies to develop modified antibiotic regimens for hospitalized newborns. She has evaluated newborn survival projects and trained health care workers on essential newborn care practices in India, Indonesia, Tanzania, and Ethiopia.